Capacity: 5G will provide the bandwidth required to enable billions of connected devices, ranging from smart phones to smart cars to smart homes, etc., to communicate with each other. Speed: In terms of speed, 5G will be a giant leap when compared to previous generations. For an eg., a full HD movie of around 1GB size will be downloaded in under 10 seconds with a 5G device and network. Latency: Response time in 5G will be significantly less when compared to 4G. For an instance a 50 millisecond response time in 4G will be replaced by 1 millisecond in 5G. In other words, a full HD movie can be watched instantly as when it is being downloaded. User experience: 5G promises a seamless user experience of switching between devices due to the substantial improvements in speed and reduction in latency. For example, a user can start watching a movie in his smart TV at home and finish it in his car's infotainment system without requiring the need to physically download/transfer any data. Energy: 5G will not only be fast but also cost effective for both users and operators. This will be achieved by significantly reducing the energy consumption. By reducing the power at the base stations, CO2 emission will be reduced, while low power devices will ensure that battery life of user devices will be significantly increased. 5G is expected to launch in 2020 and evolve in parallel with the current 4G-LTE and LTE advanced technology. 5G will enable the emerging Internet of Things (IoT) and deliver us a fully mobile and connected society. With 5G, a spectator at a football stadium will be able to watch a live stream of an alternative camera angle at the same time as it is happening on the pitch. 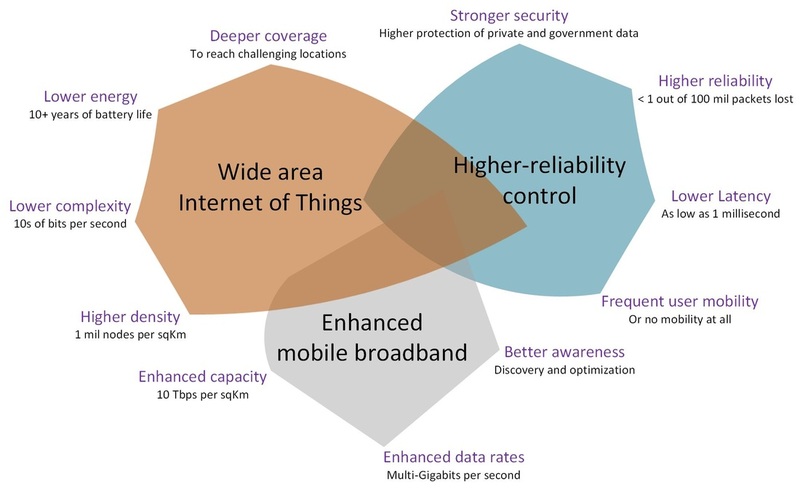 Enhanced mobile broadband with faster and more reliable user experience, varied low cost IoT with a wide range of coverage, lower latency and higher reliability are a few of the design goals of 5G. In the coming years, with the emergence of IoT, basically every electronic device including phones, tablets, refrigerators, lights, speakers, curtains, car, etc., will be connected to the internet. By 2020 it’s predicted that there will be 50-100 billion devices connected worldwide, many of which will need continuous data access, which can only be provided by 5G. 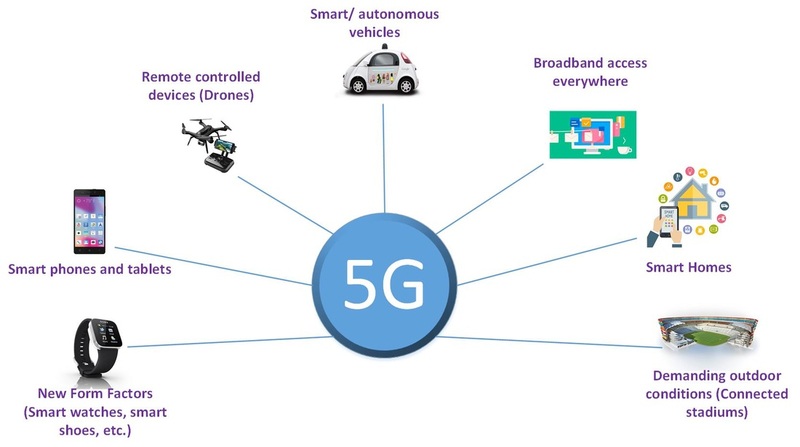 5G will take the operation of connected cars, wearables and drones to the next level. Driverless cars will soon be seen in our neighbourhood roads, that will be able to avoid accidents thanks to notification from sensors on the road (streetlights, traffic signals, etc). 5G will provide the car a seamless connectivity from one sensor to the other. Smart grids that can conserve energy resources and manage energy consumption will also be possible due to 5G. Virtual and augmented reality (VR/AR) are also seen as important additions to the society, which will not only have uses in entertainment, but also in applications such as satellite navigation appearing on car windscreens and adverts projected onto shop windows, holographic projections of outer space for research labs, etc. Holographic video could become a reality, which could be used for 3D medical imaging, 3D architectural designing, 3D video chatting, etc. Further, it will be possible to control industrial equipments remotely for safer working practices, and a doctor in New York will be able to remotely carry out a surgery in Kathmandu using a robot. The possibilities do not end here and are quite simply, endless. All these will be made possible by 5G. Challenges and how can a 5G network be achieved? As lucrative as it may sound, there are several obvious technological challenges, that need to be overcome before 5G can be a reality. In addition, one of the primary challenges apart from the technological ones is the spectrum paucity that has been created due to the exponential increase in the number of wireless devices and ubiquitous services. Spectrum availability is extremely limited and radio frequencies used for 3G and 4G are already overcrowded and almost saturated. Hence, keeping in mind that the current wireless spectrum is almost saturated, it is imperative to shift the paradigm of cellular spectrum to a new range of frequencies. In this regard, millimeter wave (mmWave) bands with significant amounts of unused or moderately used bandwidths are being considered as a suitable alternative to the current microwave spectrum. The availability of bands in the range of 20-100 GHz makes mmWave a lucrative prospect in the design of 5G networks. Other promising technologies for 5G wireless networks that has recently received significant attention to potentially provide a considerable improvement in spectrum and energy efficiency are very large multiple-input-multiple-output (MIMO), also known as Massive MIMO, Full Duplexing (FD), Non Orthogonal Multiple Access (NOMA), Authorized/Licensed Shared Access(ASA/LSA) techniques, etc. With the volume and diverse areas of utility, applications and services envisaged, 5G would need to be more than just a mobile network to be successful. A 5G architecture will have to be a heterogeneous end-to-end network environment that will support a wide range of devices. The architecture will utilise both hardware and software in synchronisation with each other and accordingly, incorporate network function virtualisation (NFV) and software defined networking (SDN) to enable intelligence and automation. The architecture will encompass mobile and fixed network infrastructure, smart devices from smartphones to wearables to machines such as cars, TV, refrigerators, etc., and network and management functions. On the radio access side, due to their low travel range, the use of mmWave frequency bands will be met with obstacles such as buildings, trees, etc. Densification of base stations by the use of smaller cells, as well as the use of new antenna technologies such as massive MIMO can increase directionality that will be needed to deliver better coverage, speed and reliability. The Edinburgh 5G and Beyond Research group, under the supervision of Prof. Tharmalingam Ratnarajah is mainly based at the Institute for Digital Communications, University of Edinburgh. Researchers here conduct research in future generation wireless communication technologies in collaboration with, and on behalf of industry. The main aim of the group is to accelerate 5G research through engagement with major industrial partners in order to meet the growing demands of data rates which is projected to increase exponentially by 2020. In the next 5 years, we plan to contribute to the development of 5G technologies to satisfy the future mobile broadband demands such as 1,000-fold gain in capacity, connections for at least 100 billion devices, and a 10 Gb/s individual user experience capable of extremely low latency and response times. The primary center for research is located at the King's building campus of the University of Edinburgh. It is integrated with the school of Engineering and is a part of the Institute for Digital communications.